Look at that chunky chunk sitting there just teasing us! These blondies are fudgy and moist with lots of soft chunky bits thanks to the addiction addition of chocolate chips and almond paste. The key to their fudginess is in adding just the right amount of milk. The batter should be just moist enough that it's not crumbly, but not too moist or they will be a bit more cakey. If your batter is a little too moist you might want to bake them for an extra minute or two. 1. Preheat oven to 350 degrees F and lightly spray an 8x8 metal baking pan with cooking spray. 2. In a small mixing bowl stir together the almond butter, milk, oil, vanilla extract, almond extract, and sugar. Stir until a smooth creamy mix forms. 3. In a medium size mixing bowl stir together the flour, baking powder and salt. Gently stir in the chocolate chips and almond paste chunks. 4. Pour the liquid mix on top of the flour mix and gently fold until all ingredients are just incorporated. Take care not to over mix or stir too much! The batter should be very thick and stiff but not crumbly, if it's crumbly add an extra tablespoon of milk. 5. Spoon the batter into the prepared pan and spread it with a spatula or the back of a spoon. Sprinkle a few chocolate chips and almond paste chunks on top. Give the almond chunks a little push so they sink a bit into the batter. 6. Bake for 15 to 18 minutes or until a toothpick inserted in the middle comes out dry. They won't rise much at all. If you want to brown the tops a bit, you can broil it keeping an eye on it for a minute. Don't look away for a second or the pesky things will burn! Cool for at least 30 minutes before cutting it into squares. Or if you're me, start eating them right away even if you have to use a spoon. * I have made these a few times, each time with a different type of milk. The ones with soy milk took a half cup, the ones with almond milk took a third cup, and depending on how soft your peanut butter is, it might take as little as 1/4 cup. Start with that and add more if you need it. ** The almond paste chunks are optional, but they really make these extra yummy! You can throw a handful of sliced almonds in there instead for an extra almondy crunch. I'm not a big fan of crunchy bits in my blondies though, gimme the fudgy bits! I love those chunky bits of almond paste! 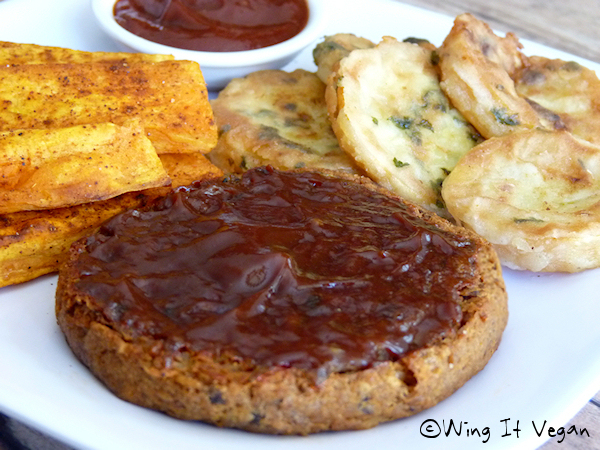 I *LOVE* these black eyed pea patties! Too bad I didn't have any buns, because they really would have made a great burger. The barbecue sauce is practically life-changing! I'm not a big fan of barbecue sauce but I absolutely loved Bianca's! It's that good! i've never had almond paste, but those blondies look great! Ohhh I'm drooling over here. Suddenly I don't feel as sad that the halloweenie fun is so far away. Those blondies look INCREDIBLY fudgey, almost like delicious blondie dough. Yum. And all of the Vegan Crunk food looks tremendous as well. Yum yum. I'm drooling right now looking at those blondies. The veggie burgers look great too. Thanks for sharing these delicious treats with us! I am SO making those blondies! I have always liked almond butter but for some reason I can't stop eating it lately. I have a feeling your blondies will disappear quickly! I'm wishing I was a vegan crunk tester too, that BBQ sauce sounds amazing. I have a confession: only upon my second visit to this post did I notice that there was more to it than the blondies. Wow. I am making those ASAP! I'm not a big fan of almond butter (though I love almond flavor) and I have a big jar I've been looking to use and this sounds perfect! Thanks! My bf is a HUGE bbq sauce fan while I don't think it's that great. I think I'll have to by that book just to make the sauce! And your blondies look delicious, I love the golden colour! Update: I made them. Yes, already. They are freaking amazing! Thank you so much! Oh man, I WANT those blondies! Kelly - YAY! These are lack-of-halloweenie-fun antidotes! Mmm. Blondie dough! Maybe I should make me some flourless blondie dough next time! Ooooh you're an evil genius! Isn't all the Vegan Crunk awesome? Jessica - My pleasure! And thank you! Now I wish I had taken a picture of a burger bite, to show what it looked like inside. Oy! I guess there's always next time! Mandee - From one BBQ sauce avoider to another - this sauce is amazing! I've always disliked it, but now I have finally found a BBQ sauce that doesn't make me gag! Bianca's book is going to be awesome! Thanks River!!! You're sooooo kind! I'm really glad y'all like the sauce and the squash and burgers. I just had some fried squash a few days ago. On blondies: OMG! I'm always been a brownie over blondie person, but I think that recipe would totally convert me. I LOVE almond butter! Must make these!! 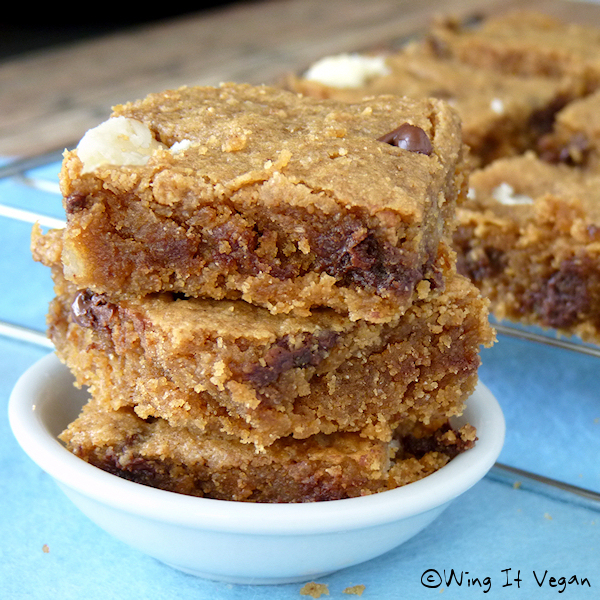 Confession - I've never had nor made blondies. I think this needs to be fixed. Ummm... yum! To all. I love seeing what Bianca cooks up on her blog. I love the look of those blondies too. I am also on a big almond butter kick at the moment. I am very much enjoying apple slices and almond butter for a nummy snack during the day at the moment. I wish the damn stuff wasn't so expensive though. Oh, chocolate and almond paste together? Drool! I've never had success with blondies before, but these are perfect - beautifully crisp on top, moist and fudgy in the middle. Heaven! And the almond flavour was much more subtle after baking them (I tried a little of the raw batter, I admit it!). Where's your cook book? Seriously. I have lot's of cook books (I mainly buy them to look at the pictures!) but have never had so much (consistent) success with anyone's recipes like I have with yours. 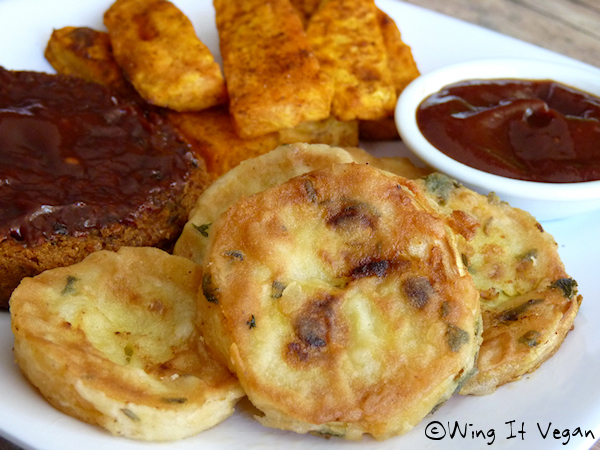 You are my baking hero, and I want a Wing-It Vegan cookbook for my collection! Susan G - I know! They are such a yummy combo! I'm thinking a chocolate/almond paste filled croissant would be awesome! Wabbit - YAY!! I'm so glad you like them! My fingers were tightly crossed while I was waiting for your feedback! Did the raw batter taste good? I want to make some flourless almond butter dough next time! Should this blog be renamed Wing-It Almond Butter? Those blondies look. . . like. . . the blondies of my dreams! The blondies I want to marry! The blondies that will be my everlasting love! I. WANT. BLONDIES!!! Oh, and just btw (just ignore the drool on my mouth), you can make your own almond butter, easy-peasy and quite economically if you have a decent food processor. Just toast, cool, and process (for a while--like 5-10 minutes). Seriously, the best almond butter I've had! Now I just have to figure out where to get almond paste. . .
You are evil, you do know that...don't you? I am officially hungry and it is time for bed. Sooo not fair. I tried to post a comment earlier but blogger was being stupid. I am so glad Wing it is back!! I'm over a month late but SQUEEEEEEEEEEEEEEEEEEEEEEEEEEEEEEEEEEEEEEEEEEEEEEEEEEEEEEEEEEEEEEEEEEEEEEEEEEEEEEEEEE!!!! I think those blondies look freakin amazing!! You are a brownie mastermind! Yum! How far of a drive is it to your house? Hee hee. Wow, those blondies look so fantastic! I've had peanut butter blondies, but considering I'll take almond butter over peanut butter any day, I do believe these will be a winner! I cannot wait for Bianca's book! Those blondies look really, really good! I make my own almond butter because the stuff is way too expensive over here. But I might splurge for this recipe. i was on a war path for sweets last night...those blondies would have done just the trick! i've got some of said almond butter in my fridge....might have to prepare for sweet tooth attack part II tonight! wow. this all looks amazing! i've never made my own bbq sauce, but that looks so thick and wonderful. mmm. Oh my goodness those blondies look soooo good!!! And wait a minute, Costco sells almond butter???? Allularpunk - I am so serious when I say that this is the best BBQ sauce ever! 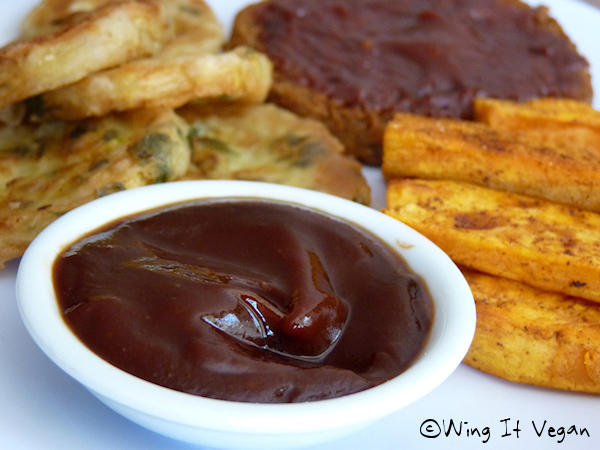 I don't ever again want to eat spicy sweet potato fries without dipping them in this BBQ sauce! Mmm, the blondies look fantastic! 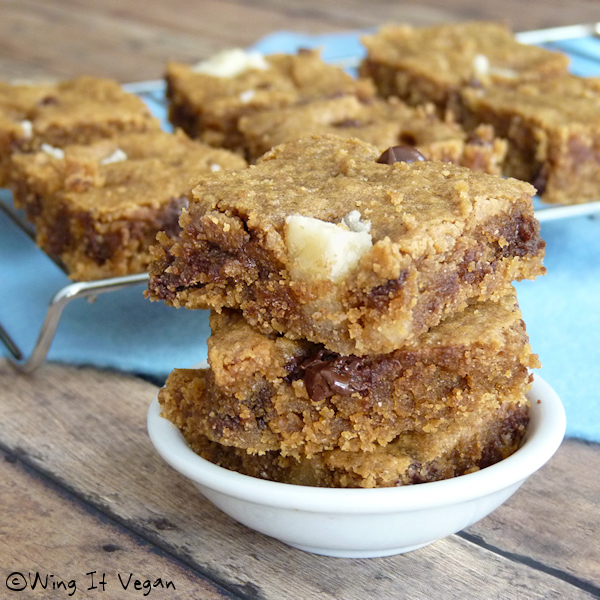 It never occured to me to put almond butter in blondies, but I think it's ingenious! You see, here's the difference. YOU'RE trying to gain weight and I'M trying to lose it... But I'm still going to have to make these. They look SO tempting. These look unbelievable! 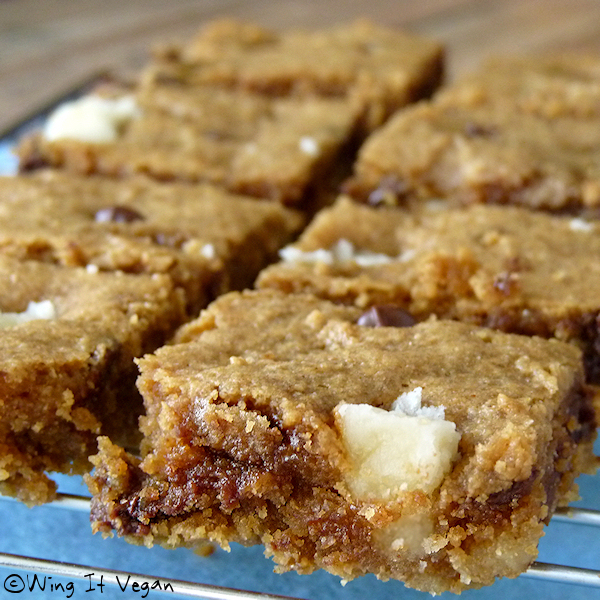 Blondies are one of my favorite things, in the world, ever...I must try this recipe. I just made the blondies last night! My two year old helped me and she was very enthusiastic about it. Anything with almond paste in it is a-ok with her! They were amazing!! The whole family loved them and agreed that you are worship-worthy! Thanks! I am so mad that I am not your next door neighbor/best friend right now! I want that! Now! These blondies look SO good... I'll have to put them on my list. I've actually never made blondies before, but this looks like a great time to start. I've never heard of almond paste, and am not really sure where to get some or how to make it. Any suggestions? What brand of almond paste do you buy? Also, where do you usually get it? I really want to try to make these, and must do it right! These were a huge hit in my Christmas goodie boxes! Thank you so much. Do you know how many calories this recipe has? I'm afraid I have no idea! I went ahead and entered the ingredients into the caloriecount.com calculator and it says that there are 289 calories per serving if you cut it into 9 squares. I like to cut mine into 12 little rectangles, which according to the calorie calculator is 217 calories per piece. I hope that helps!